"Just 10 days back, he was an active and happy child, he used to play all the time. Now his stomach is swollen causing severe pain and he can't eat even two spoons of food, he cries uncontrollably. Our lives have changed upside down. He is pleading to take him back home. I can't bear to see him going through so much of pain. Doctors have given us only 10 days time to do the surgery. His life is at risk but I'm helpless." - Nagaraj, Hemanth's father. 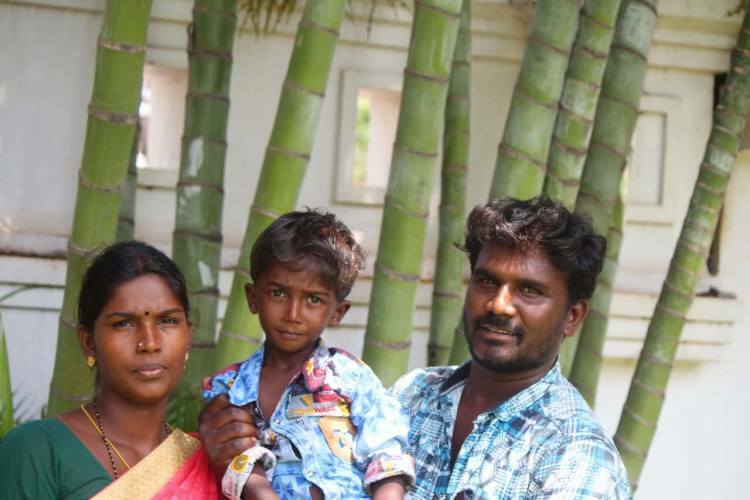 When Hemannth complained of pain in his stomach, Nagaraj and his wife Jenitha thought he had not eaten properly. The pain got worse and was accompanied by high fever. They were terrified when his stomach and legs started swelling. Yet, they were least prepared for any devastating news. "We were asked to take him to a bigger hospital. I borrowed money and came to Bangalore from my village. This is the first time I'm taking him to a different place but we came straight to the hospital. He is crying the whole day. He hardly eats but has severe dysentery. He has become too weak. Swelling keeps increasing day by day. Doctors say that only a surgery can save his life. " - Nagaraj. 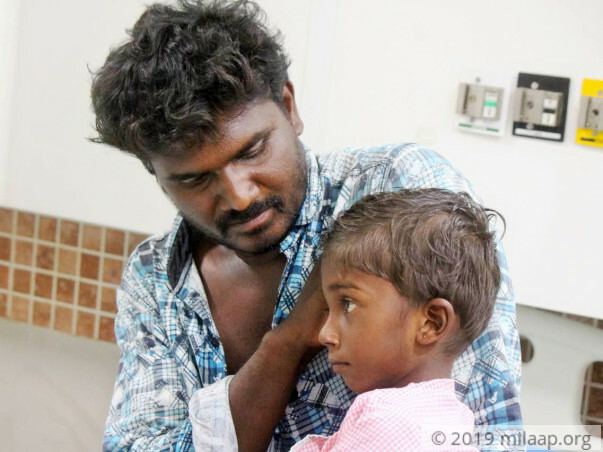 5-year-old Hemanth has a very rare liver disorder that occurs one among million people. He has Budd- Chiari syndrome which is caused by blood clots that block blood from the liver. Fluid accumulates in the abdomen, and spleen enlarges. It also leads to severe bleeding. His parents did not understand what the doctor was saying and it took days before its severity could sink in. "I'm a daily wage laborer in my village. Since the diagnosis, I was not able to go to work regularly. My relatives are helping me but now they are also exhausted. I'm struggling for my next meal itself. I have spent everything I had in these 10 days. His medicines are expensive. I don't know how I'm going to manage the surgery cost." - Nagaraj, father. 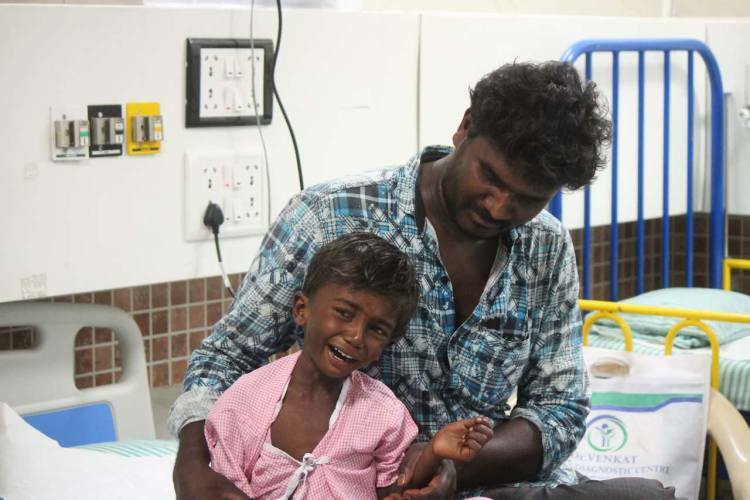 Hemanth's parents are in deep pain and trauma. They spend sleepless nights. They have seen the horrors of having this severe disorder. 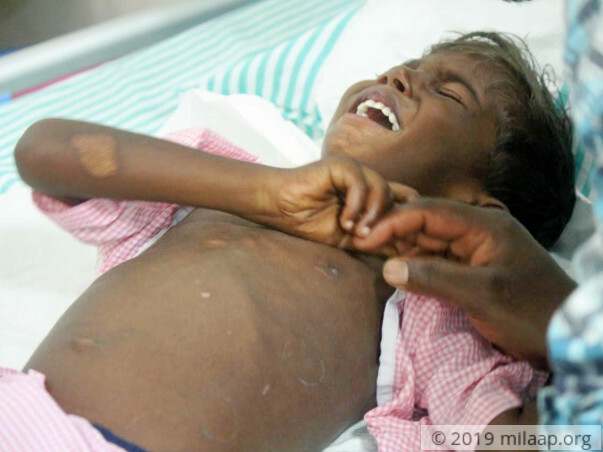 Their son's little body cannot bear the pain and it is only growing day by day. Medicines are not helping him in any way. 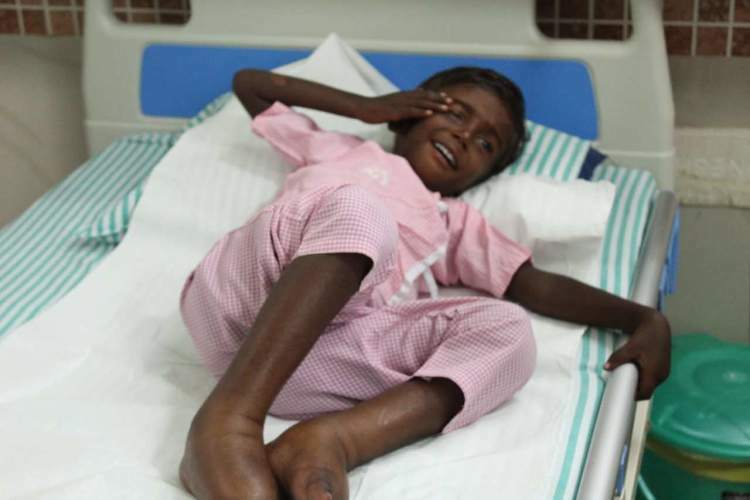 Nagaraj has already spent Rs 80,000 for his treatment by borrowing from his relatives. Now he has no income and is desperately looking for a help to pay Rs. 4.5 Lakhs for this surgery. He is willing to do anything to save his only child. 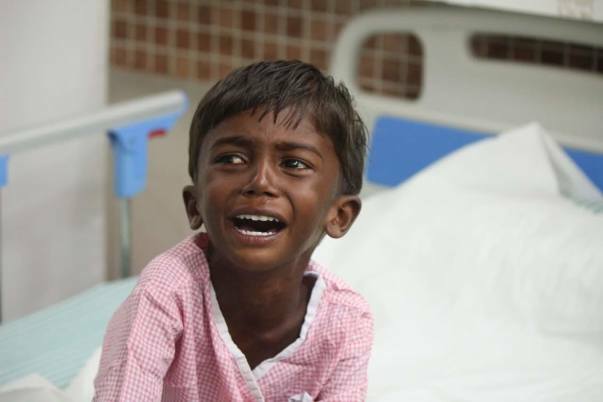 5-year-Hemanth's rare liver disease may turn fatal without an urgent surgery. "I will lose my son without your help. I have promised him to take back home. I can't see him suffering so much. My wife and I will not have any reason to live without our son." - Nagaraj. We are extremely grateful for the love and support shown towards Hemanth! He has been discharged from the hospital and is doing better now. Doctors are hopeful that his condition can be controlled with medications for the next year or two, post which he might require a transplant. We are required to take him for monthly check-ups. He gets pain in his abdomen once in a while, if the pain is unbearable we have to take him to the hospital immediately for a check-up. We are hopeful he will recover completely. Please keep him in your prayers. 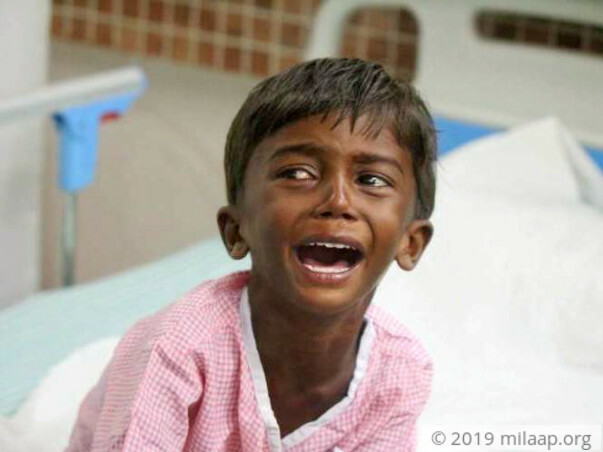 Hemanth is now doing better and is on medication. He is yet to undergo the transplant. His next visit to the doctor will be due in about three months' time, post which, depending on his response to the medication, the doctors will take a call on when to schedule the surgery. We are all hopeful about my son's recovery. Please keep praying. Thank you once again! 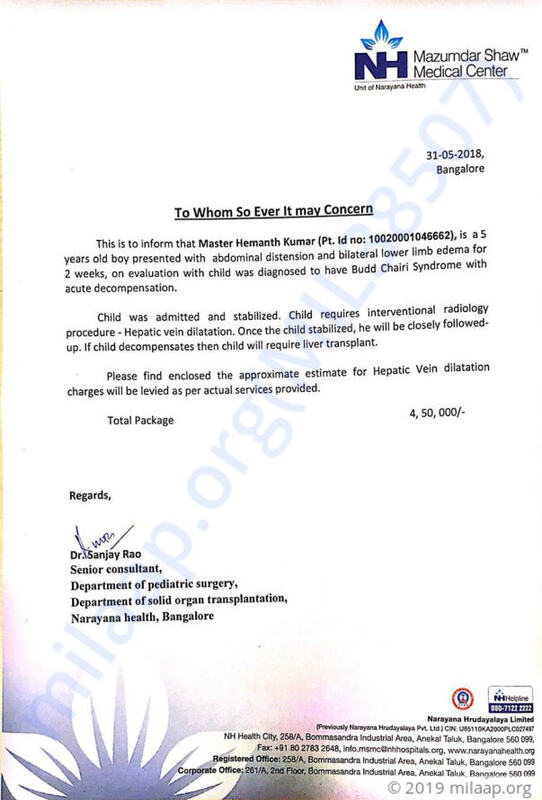 Thanks for your support to help Hemanth to get out his problems.Child was diagnosed to have Budd Chairi Syndrome (blockage of any of the three veins which drain blood from whole body though liver), when he had presented with whole body fluid collection, abdominal pain, irritability. Initial plan was to stable him symtomatically and then dilate the blocked veins. This Dilatation will buy us sometime before Liver transplant. Hemanth had improved symptomatically and further imaging had suggested only one vein is blocked and the other two veins are draining. So liver transplant team and paediatric gastroenterologist discussed and decided that we will follow up Hemanth closely. We will keep you further posted on his condition..